Parking at Hightown Common, just north east of Ringwood, I walked down to Foulford Bottom and then around the valley to Picket Post and back. One from the morning walk at Ibsley. 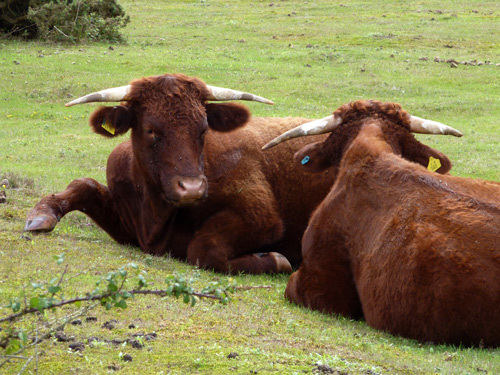 These two Red Devon cows lie chewing the cud and look for all the world like they’re chatting amiably in the sun. 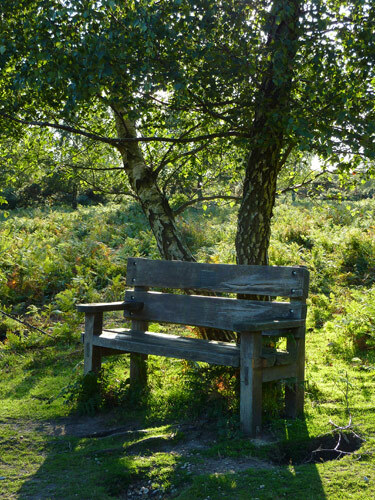 I start out from the Hightown Common car park and pass this bench, I always find it very poignant…. 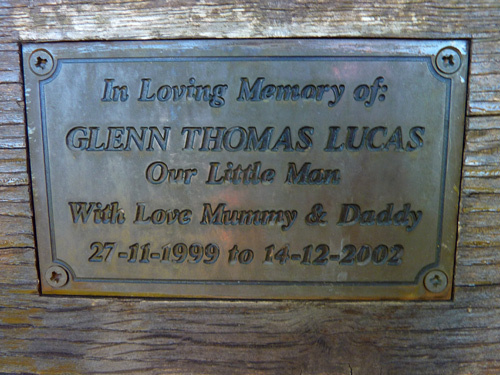 …but what a happy view for those who knew the little chap to sit and remember. 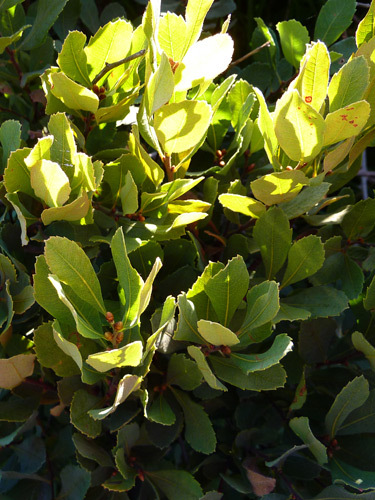 …and lots of Bog Myrtle. The scent of it fills the air on this lovely warm evening. I pass Foulford Farm and approach the brook. Looking back the trees are lit by the evening sun. The brook through Foulford Bottom. 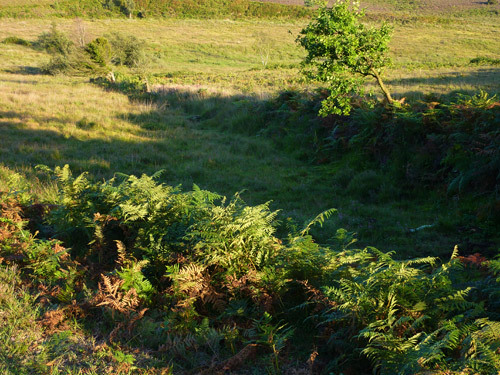 I leave the brook behind and climb out of the trees into the open valley and look over towards Picket Post. Looking ahead to the old smugglers road that leads from Christchurch into the Forest and on to various places where their merchandise could be distributed. Harry waits for me. 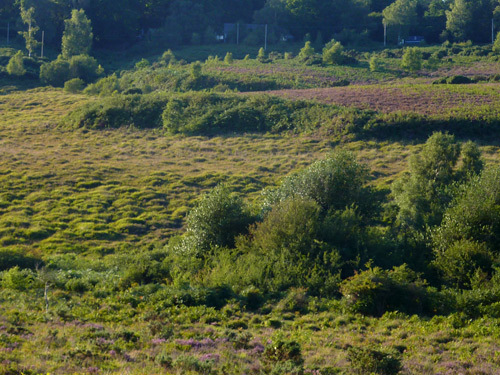 Above the trees in Foulford Bottom, there is a defined line where the heather and firm sand of the moorland gives way to the tussocks, reeds and cotton grass of the bogland in the Bottom. 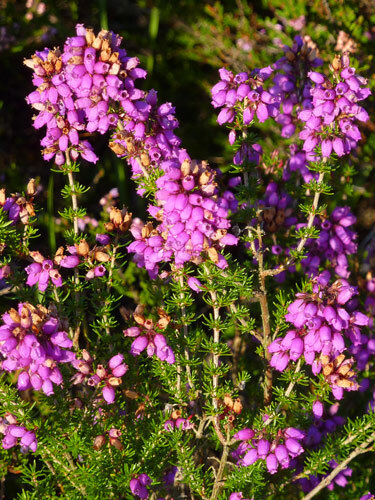 The heather is brightest purple in the evening light. 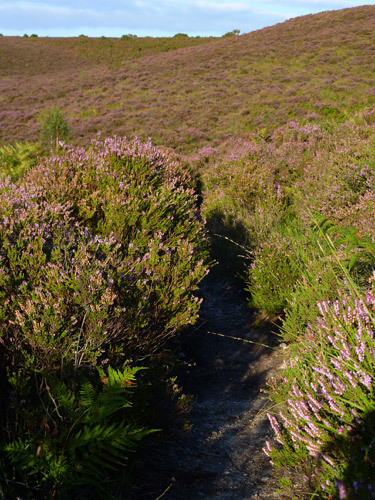 The heather on the edges of the sandy paths here is waist high. Watch out for ticks! 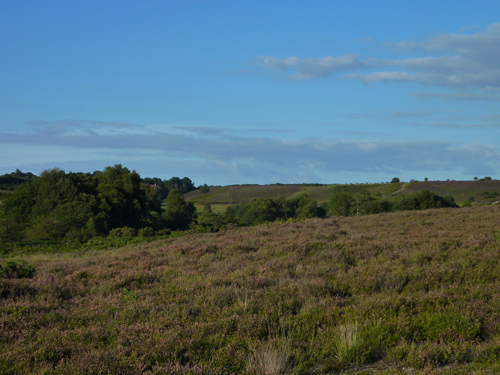 I look back over Hightown Copse and Crow to distant Dorset. 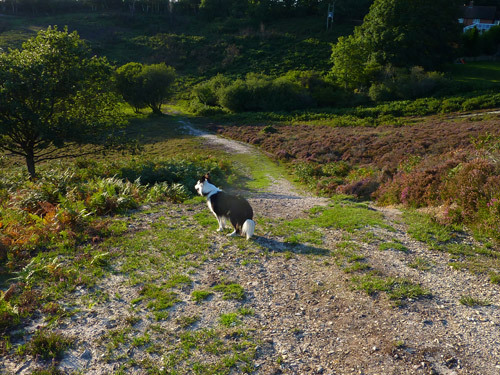 At the outer edge of the walk now, Harry pauses at the top of the short, but very steep slope down from Picket Post. 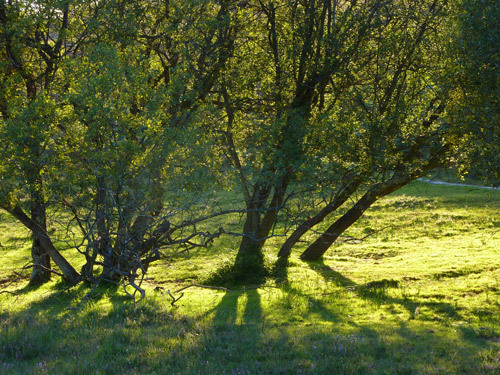 At the bottom of the hill, trees and shadows. As I follow the path this old earthwork, an old fence line on the ordnance survey map it seems, stretches down towards the bog. 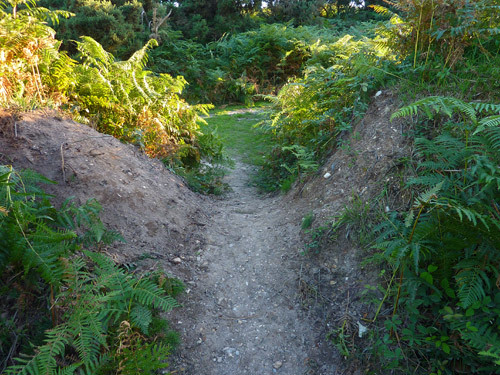 The path crosses the earthwork. 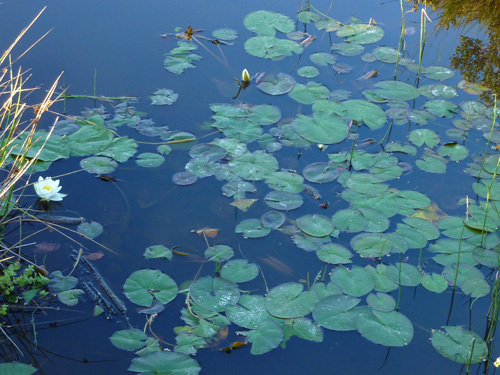 A short detour down to the stream so that Harry can have a drink – waterlillies beside the bridge. 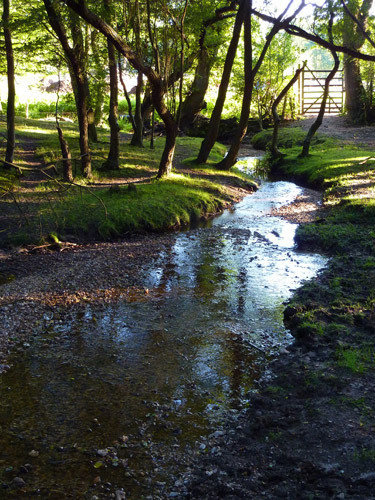 This crossing of Foulford Brook is called Ziegler Passage – the Zieglers are a local family of note. Back towards the car park and a last picture of the lowering sun silhouetting the holly trees ahead of me. With Rosie, our Boxer, we did this walk, almost by accident at the beginning of October 2012. It was exhilarating and enjoyable. Enjoyed your photos. 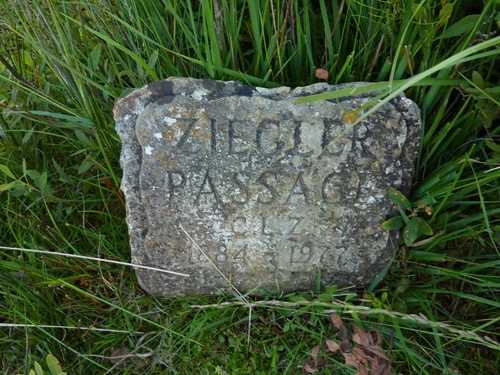 Wonder what is the significance of the dates on the Ziegler plaque 1884 – 1977? I’ve not heard of the family. Thank you for taking the time to look through the photos, I’m glad you liked them. It is a lovely walk. 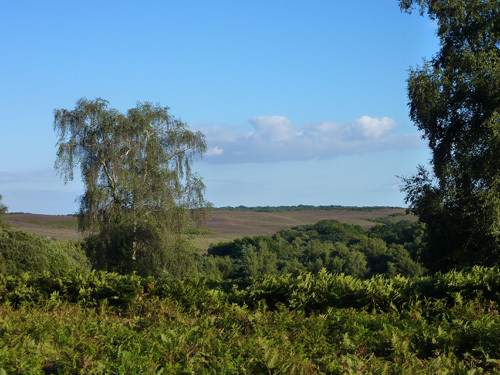 As I understand it, the Zieglers are an important family in the New Forest area, William Ziegler was head of the New Forest Association until recently and the area is named for one of his ancestors. 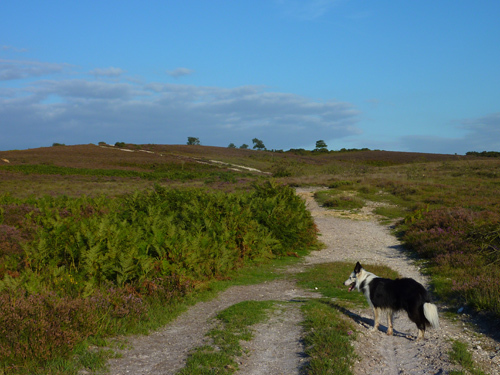 That bit of the walk is known as Zieglers Passage. I know another place in the Forest that has a stone marker in a similar way. If it is similar, then it may be that funding to provide safe passage across the boggy valley was provided either by that person, to somebody’s memory. I am so glad you enjoyed your walk. I was born and bought up in the valley, with a number of my family living in the area, including my grandfather Major Colin Louis Ziegler in whose memory the stone was erected. 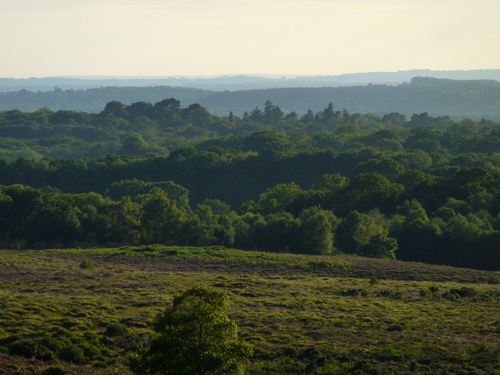 He was a stalwart of the New Forest and worked tirelessly for many years to ensure its protection and conservation. Like myself he was honoured to have been Chariman of the New Forest Association which is now recognised as The NF Society. 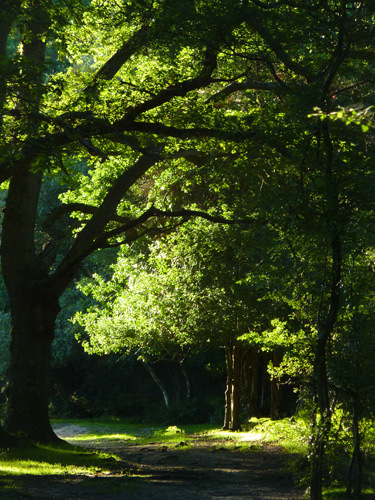 If you have not heard of it please have a look at its website, it deserves your support as does the New Forest. 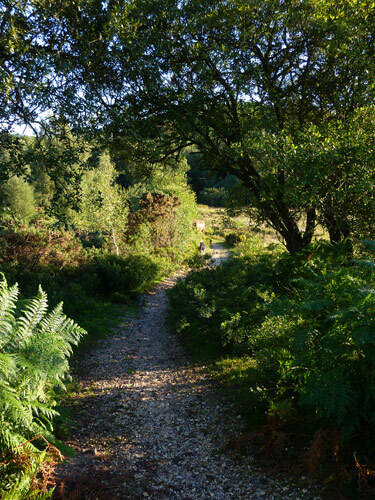 I now chair the New Forest Trust, another excellent charity which works to preserve the NF by raising money which is distributed by grant to others working for the benefit of the Forest. Again it has a website and needs support. Thanks for your comment William. 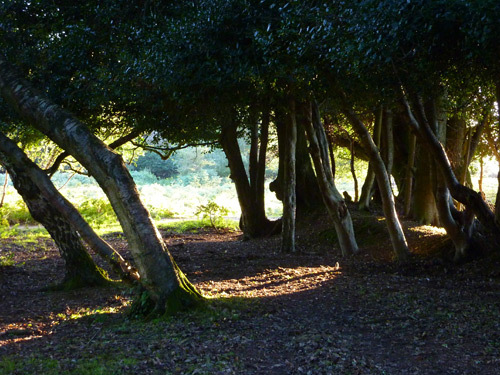 I am aware of the New Forest Association and the New Forest Trust, but know little about them. I shall have a look at the websites and find out more!